If you notice, this run was a lot faster than I’ve been running lately, which made me so happy! I honestly think the heat has been slowing me down majorly, and while intuitively that makes sense, I was starting to lose a little faith in that when time after time I was getting over 10:00 min/miles. Now, don’t get me wrong – 10:00 min/miles is not a bad thing at all for me or for many people. But when I first started running I was going faster than that, so it was just putting me off a bit to be slower than when I first started a year and half ago. While the meal that I ordered was healthy, I ended up totally overdoing it to the point of feeling sick to my stomach. I had way too many chips and salsa, plus queso that the girls ordered. Then I ended up having.. 4 flour tortillas!! I never have that many – I don’t know what got into me. But when we walked out, my stomach was hurting so bad. I ended up just having a green smoothie for dinner while everyone else had Caesar salad with chicken because my stomach was feeling so off still. Both yesterday and today, I had savory oats for breakfast. I always think of oats on the sweeter side and usually have them with fruit, cereal, nut butter, or other sweet/dessert-y toppings. But yesterday, I got a hankering for Savory Oats, so I made oats with green onions and salt, then put a fried egg on top and a veggie sausage. This morning after my run, I was craving something very similar, so I just went with it. 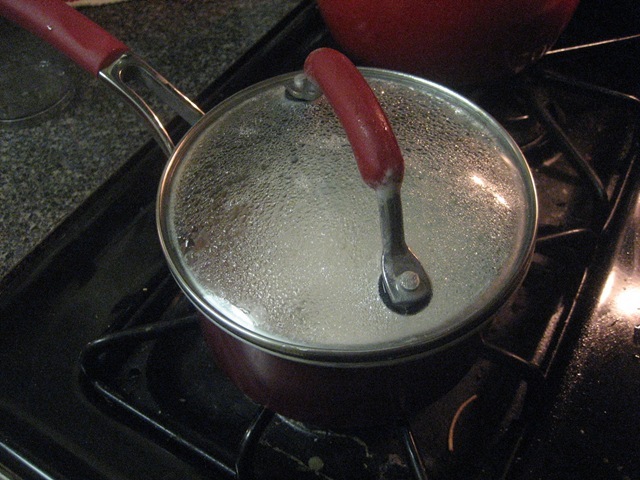 I sauteed an onion in a pan while cooking the rolled oats in water. While those were finishing up, I poached an egg in a pan of boiling water and vinegar, and put it on top of the finished oats. If you’ve been reading my blog for a while, you know by now that I looooove poached eggs. Cracking the runny yolk onto whatever I’m eating with the egg is therapeutic in some way for me. So delicious. The whole bowl was 1/2 cup rolled oats (2 pts) cooked in 1 cup water, with 1/2 cup onions (0 pts), salt, and 1 egg (2 pts) for 4 points total. This hit the spot big time and has left me very full and satisfied. Have you ever had savory oats before or do you keep them fruity/sweet like I normally do? What are you favorite toppings for either savory or fruity? I love getting new ideas for things like this! Happy Hump Day! We are over half way through.. keep on truckin’. Today’s eats have been simple, but very on track (woohoo!). 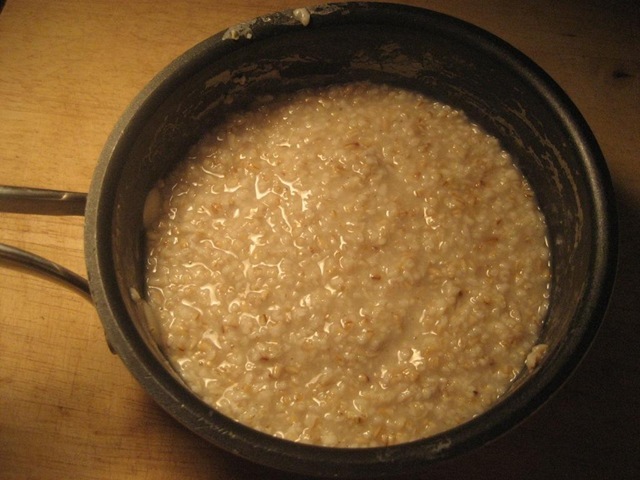 Breakfast was a delicious bowl of hot oats, which I made with soy milk for the first time… ever? This bowl was goood, but I honestly couldn’t tell very much of a difference in taste/creaminess from using the milk instead of water like I usually do. I’ll probably stick with water just to save myself the points since it doesn’t sacrifice taste or fullness. I have another farm share coming tomorrow morning so trying to use up all the apricots – still have 5 teeny ones left! This granola is AWESOME. I need to go back and get more because I’m all out. For 1/2 cup, there are 130 calories, 4.5 grams of fat, and 3 grams of fiber, so 2 points. 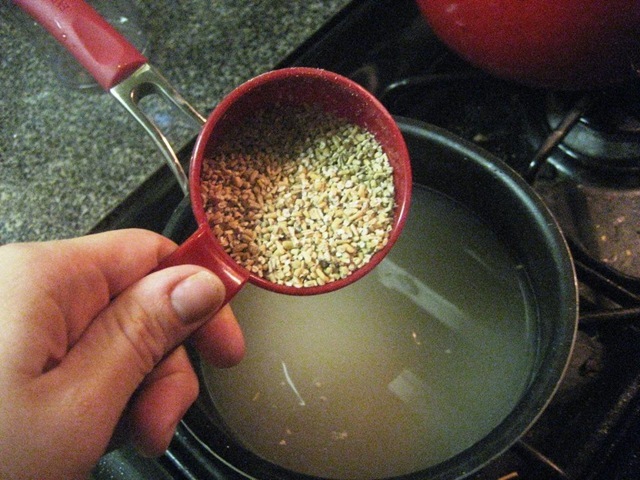 I’ve been using just 1/4 of a cup as a topping and it adds a really nice crunch/flavor and is really tasty. These crackers are seriously amazing. Go to Costco and buy them. I tend to have trouble with bulk buying because I tend to eat more when I’m eating from a large bag. The huge package of crackers from Costco came separated into two bags inside the box, so I divided up one of the bags into single serving ziplock bags. That way I can just grab a bag and not be tempted to go back for more. I did however eat all of the broken crackers (those don’t count, right?) while I was separating them into servings. On a completely unrelated note, I love looking at the stats page for my blog in the “Search Engine Terms” box because some of the things that people search for that lead them to my blog crack me up. Yesterday someone searched, “feel great without coffee” and today “yoga skinny before after”. My all time favorite one so far though is “hungover bikram.” DON’T DO IT! ha. Anyways, later today we have a work party for someone who is leaving and there will be booze and food. I actually ran into them last night at Costco, so I know there will be some healthy options including shrimp cocktail and a veggie tray. My goal is to go to a 7:30pm Bikram class tonight, so I’m going to do my best to have no drinks and just stick with water while I’m at the party… we shall see how it goes. What are you best tricks for staying healthy while at parties/gatherings with lots of food and drinks? I woke up early this morning to go for a run since I hadn’t worked out since Saturday. To be honest, I was kind of dreading the run before I went (mostly because I was awake before 7am, but partly because I hadn’t run in a week and I thought it was going to be hard!). It ended up turning out really well! Because of my dead computer, I couldn’t plug in my Garmin for the breakdown of stats, but I found this cool running calculator that can help you calculate pace or speed to figure it out. Overall, a great run! The weather was perfect, a lot cooler than it has been for the last week or more. I think it was around 70 degrees and a little breezy. Amazing. After I got back from my run, I was HUNGRY. Yesterday I saw this technique for Blended Grains, where you make your oatmeal like normal (or any other grain you want) then you blend it up. You can use a blender, food processor, or handmixer, and it basically gets really fluffy and turns into whipped oatmeal. I was thinking about it during my run, so figured why not give it a shot! It’s kind of hard to gauge the consistency of it from this picture, but it was really creamy and delicious. I added the egg whites to give it a little protein and I couldn’t even taste that they were in there. I will definitely be blending up my oats or some other grains again – I loved the texture of these! I had a pretty huge Pink Lady Apple (1 pt) for a mid-morning snack. Lunch was half successful, half not-so-much. Bad news first. I had some arugula in my CSA from last week that I wanted to use up (since I get a new box tomorrow) but it has so many tiny holes in it! I looked it up and found out that the holes are from flea beetles and I guess it’s common for them to eat arugula that is organic. That said, I rinsed the arugula really really well, but it was grossing me out as I was eating it. So 6 total, which is not bad at all. What are some of your favorite things to healthify? I love making pizza at home because it’s one of my favorites! Regular pizza can have so much fat/calories/points (which I still eat a bit too much), but making a healthy version at home is pretty easy and delicious. I also like to make my own fries at home, another one of my favorite unhealthy things that can actually be really good for you if you make it in your own kitchen. With that, I’m struggling a bit with my healthy lifestyle. I woke up yesterday with the best of intentions and had a healthy breakfast and lunch, and then was planning on working out and cooking dinner. I even got in my workout clothes and was going to go out for a run, but I just couldn’t make myself go. I laid down on the bed but didn’t go to sleep and just lost all motivation to get out and didn’t end up going. I did end up doing some Bikram postures on my own so stretched a bit and got my heart rate up a little, but it was by no means the workout my body was craving. It’s so easy to let two days turn off into three and then into four, but today it has to stop. I brought my running clothes with me to work and plan to run home from work, which should be about 5 miles. Breakfast today was hot oats, for the first time in ages! When I was browsing around my kitchen this morning I spotted the Bob’s Red Mill Scottish Oats in my pantry and thought about eating them hot and got excited because I seriously cannot even remember the last time I’ve eaten hot oats since I discovered overnight oats, so today was the day. I’d never used egg whites in oats before, but wanted to add a little natural protein (not protein powder) so decided to give it a go. I boiled the water, then added the oats, then stirred in the egg whites a few minutes later. The oats had to cook for 10 minutes in total, and they turned out really fluffy. I wanted to dress them up a bit, so I used 1 tbsp unsweetened carob chips (.5 pts) and 1 tbsp unsweetened coconut flakes (.5 pts). I put the oats into the microwave with the carob chips to get them a bit melty, and I put it in for way too long so the oats sort of boiled over the chips and almost exploded. I ended up just mixing the carob into the oats and then putting the coconut on top. These were really good! I find that when I use protein powder I can taste it in the oats, so I wanted to use something that would add protein but not much flavor. I couldn’t taste the egg whites at all in the oats, so we’ll see how long this bowl of oats keeps me full. I think it definitely made the texture a bit fluffier than normal, so this bowl was pretty awesome. Questions about oats! Do you like your oats hot, cold, or both? Favorite toppings? Favorite kinds of oats? I like my oats every which way and am sad I went so long without them hot. It’s just so easy making overnight oats (or same day cold oats) that require zero cooking, so its pretty tempting to make them regularly. I love doing nut butter as a topping but have tried to limit the nut butter while I’m trying to lose more weight because it’s pretty pointy, though 1 tsp only has 1 point so maybe I’ll give it a go. 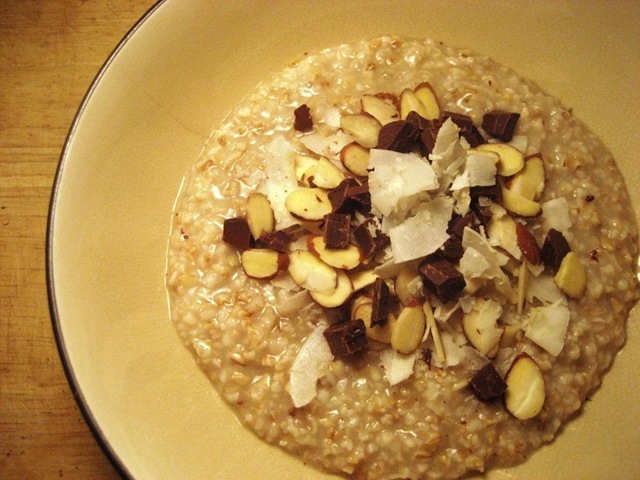 I use rolled oats regularly but just got into scottish oats which have a nice creamy texture. Hello! Sorry I’ve disappeared yet again for a few days, but I promise I’m alive and well. This weekend was SO fun and incredible, celebrating my best friend’s bachelorette. What happens in AC stays in AC for the most part, but I thought I’d share a few pictures with you! And then at the end of the night at the club. It was soooo much fun and really great to be reunited with all of my college friends. It had been over a year since we were all together… far too long! As far as trying to be healthy on the trip, I sort of let it go because I think it’s important to let go and have fun for certain special occasions, like a bachelorette party for one of your best friends. I ate healthy during the day on the way to Altantic City, having a Egg White flatbread from Dunkin Donuts and plenty of iced coffee. 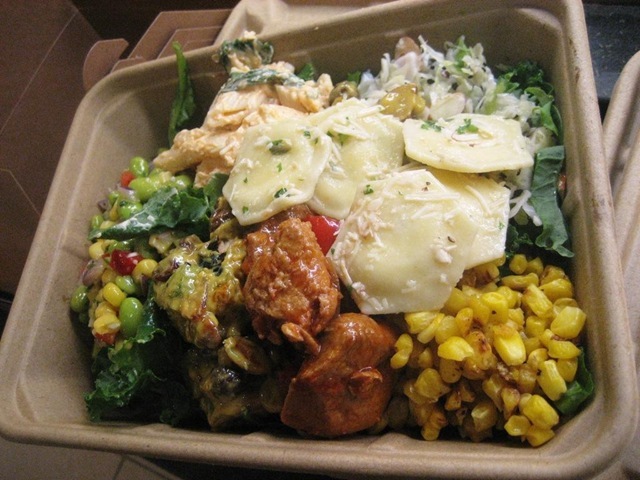 Lunch was a salad from the food court with spinach, mozzarella, avocado, and chickpeas, and then dinner was lots of bread and pasta to have a good base for a night of drinking and fun. It’s funny how it can be so refreshing to go back to your normal routine once you have a crazy weekend of traveling and going out. Even though I have this breakfast quite frequently, I was so happy when I was putting it together this morning and even happier when I was eating it. I didn’t bring a lunch today so I’m going to have to run out and get something, but I plan to be back on track with eating, cooking, and exercise, starting today. Have you ever been to a bachelorette/bachelor party or did you have one if you’re already married? What did you do? If you’re not yet married, what do you think you’d want to do for it? Morning! Today is hoootttttt outside, even before 9am. They are saying its going to get up into the 80s so a walk outdoors at lunch time is going to be completely necessary. Breakfast today wasn’t terribly exciting, but it was delicious. I had cold oats, but this time topped them with frozen Very Cherry Blend from Trader Joe’s. It has cherries, blackberries, raspberries, and blueberries, and a cup has 90 calories, no fat, and 5 grams of fiber, so 1 pt. A few people have sent me emails or left comments saying they’d love to try these oats, but never remember to put it together the night before. I actually almost NEVER make these the night before, just the morning of. I used to pack my lunches at night but recently out of pure laziness have started doing it in the mornings. I just add all the ingredients, mix it up, and in the end it sits for about an hour before I eat it from transporting it to work. I use slightly less liquid (the amount below) than if I were to make true overnight oats because there’s less time for the oats to soak up the liquid, but it turns out almost exactly the same if you do it the same day. So, bottom line, you don’t have to plan too far ahead to have these! I know it doesn’t look that pretty, but it was awesome. The frozen berries were out of the freezer for about an hour so they softened up a bit and added a ton of flavor throughout the bowl. One of the highlights of this breakfast for me was I got to eat it with a new spoon! This picture doesn’t do justice to how cute and tiny this spoon is, but I had been on the hunt for little spoons for months! I first saw them on Kath’s blog, and I love the idea of eating with a tiny utensil because you get more bites. I found a set of 4 of these for 6.99 at HomeGoods. One of the main struggles that I have with healthy eating is that I tend to inhale my food. I try to be mindful of it and slow myself down when I think about it, but my food is always gone relatively quickly. This spoon actually did help me slow down a bit, but the bowl was still gone pretty quickly. I think if I ate slower I would eat less and be more successful at getting to my goal weight. Do you have any other tips for slowing down? What is the thing you struggle with the most in terms of healthy eating?